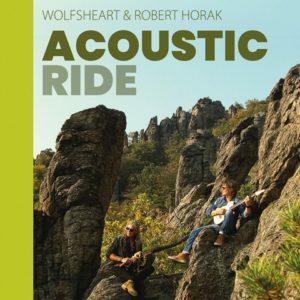 ACOUSTIC RIDE is the collaboration of two veteran musicians and recording artists, Wolfsheart and Robert Horak. The duo combines sensual melodies, brought to life by various Native American flutes, with the acoustic guitar’s subtle rhythms and weaves them into a beautifully harmonic tapestry of sound. 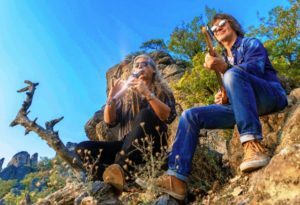 Their stylistic spectrum ranges from traditional American folk singer-songwriter, meditative roots, all the way to Rock and Blues, at which the Native American flute delightfully intertwines with Robert Horak’s acoustic guitar. In doing so they combine traditional as well as contemporary styles to form simple arrangements, which at the same time underscore the compositions’ rich diversity. By utilizing their respective voices as well as their vast instrumental repertoire, they are able to render a special touch to their performance. 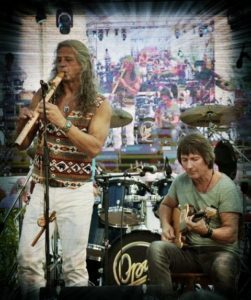 Additionally, by pairing the gentleness of the Native American flute with the elegant notes of the acoustic guitar, the duo takes you on an endless journey to magical and music inspired sceneries, filled with self-composed songs and also well-known standards. The soft accompaniment of acoustic guitar provide musical overlays to the Native American flute. This mixture crafts a unique sonic image of extraordinary clarity, which relaxes the mind and enriches one’s soul. Ultimately, the soundscapes of the various pieces will give rise to a variety of meditative and relaxing as well as smooth and lively atmospheres. CD „ACOUSTIC RIDE“: Six tracks create a musical journey of Native American flutes combined with the wide range of guitar artistry. This melting pot of Folk and World Music sounds fresh, unique and diverse, without using technical gadgets or cheap showmanship. This album delievers the essence of dedicated handmade music, going straight to the heart. So this means a touchpoint for the soul of modern listeners. There is also a guest appearance from Jose Feliciano´s longtime percussionists Salvador Fragozo, who puts additional fire in this universe of sound. Join in, you won´t regret it.